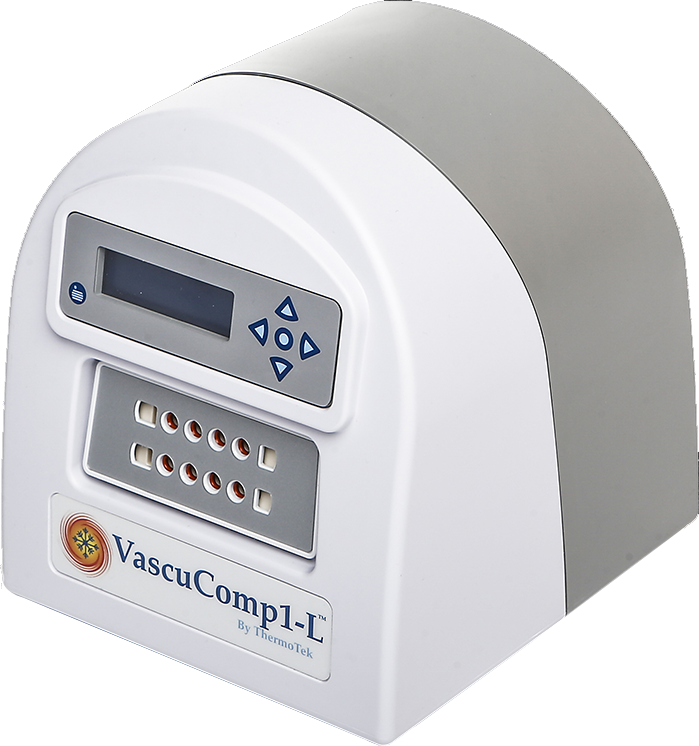 The VascuComp 1-L Therapy System is designed to aid in the treatment, reduction and control of peripheral edema, including congenital lymphedema (primary or secondary) of the upper and lower extremities, venous insufficiency, and venous stasis ulcers. The device uses a preset cycle time to inflate compressed air into the therapy wrap. This aids in the treatment of venous disorders and dysfunction of the “muscle pump”. The VascuComp 1-L is designed to deliver programmable, calibrated gradient pressures to individual chambers within the compression garment for optimal treatment. The garment is compressed sequentially starting at the distal chamber and progressing to the proximal chamber. When the chambers are fully compressed to the pre-programmed pressures, they are simultaneously vented to a rest state of 5 mmHg for a programmed time of ten to seventy seconds. The compression cycle is repeated. The chamber pressures can be individually adjusted from 20 mmHg to 80 mmHg. Each chamber can be turned off as prescribed by the physician.